The United Kingdom officially kicks off the 2013 Enactus National Competition season. 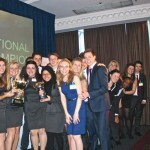 London, England – After two days of presentations from 41 Enactus teams at the UK National Competition, the University of Southampton emerged as the 2013 National Champion. As the winners of the coveted award the team now advances to represent the UK at Enactus World Cup this September in Mexico, where they will compete against 37 other national champions for the title of World Cup Champion. In addition to the competition, a number of activities at the event—sponsored by AIG, Centrica, Ernst & Young and the UNITE Group—provided opportunities for meaningful engagement among the 1,027 students, faculty and executives in attendance. Students had the chance to interact with more than 300 executives who served as judges and recruiters from 21 companies participating in the Career Fair. Nick Holzherr, a 2007 Aston University Enactus alumnus, delivered the keynote address at the event. After graduation Nick was a finalist on “The Apprentice” with Lord Alan Sugar, and has since gone on to found his own company, Whisk, a service that creates online shopping lists based on recipes. His success and the ways in which participation in Enactus helped him prepare for that success serve as great examples for Enactus students in the UK and around the world. During the final ceremony of the event Enactus UK Executive Director Jim Ineson was honored for 10 years of service to the organization and Aimee Clark and Anna Grant of Centrica were presented the Champion of Enactus UK Award in recognition of their dedication to the UK program. Throughout the event, the teams received encouragement from those participating in the event as well as members of the Enactus community around the world. We invite you to stay connected and continue to following the journey of the students, faculty and executives participating in Enactus national competitions over the next 15 weeks. Keep sharing your experiences with #WeAllWin in social media and we’d love to hear your UK National Competition stories in our comments below.